I've been away for the past week, but have to get back on track with my projects. This is for the challenge over at Decorate to Celebrate be sure to stop by and see what our talented DT has for your inspiration. Everyone seems to have the Kcup machines. 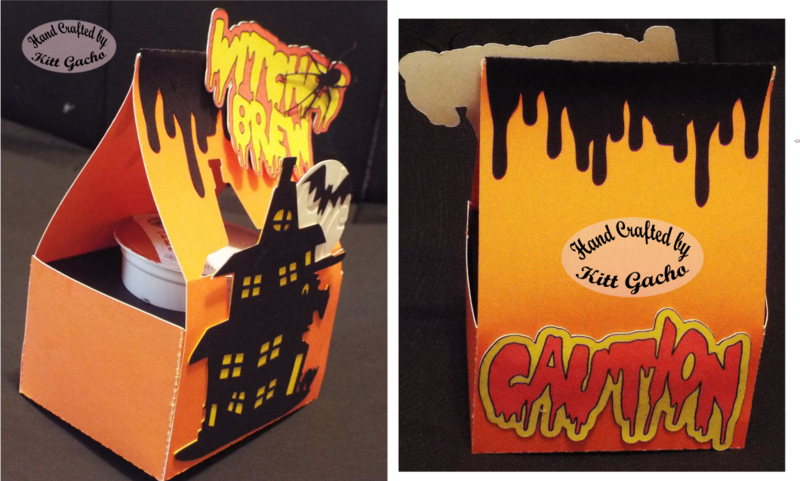 With Halloween around the corner I thought these Kcup holders were a cute idea for co workers, etc. I didn't have the Duncan Donuts pumpkin Kcups at the time I made these, but that would be a good choice for these Halloween or Thanksgiving theme Kcups. Be sure to follow me so you don't miss more 3D projects coming soon. Thanks for stopping by and leaving your comments. I love hearing from you. Have a happy crafty day. These are so fun and what a thoughtful "treat" for an adult. Thanks for joining our Halloween challenge at The Sweet Pea Stampers. These are beautifully done, Kitt! Thanks so much for playing along in our "Frightfully Delightful" challenge at QKR Stampede and I hope we'll see you again for the next challenge. Kitt: Your Halloween cup holders are so cute & very useful. Thank you for joining us in our "Halloween [or Use Lots of Orange]" Challenge #73. Hope to see your entries in our upcoming challenges too! Super projects - great colours. A lovely way to gift the drinks! Sadly, as there are no Waltzingmouse stamps, sentiments or digis, this is not eligible for the challenge. What a great idea. I love your spooky cup holders and they will make wonderful gifts. Thanks for joining us at Simply Create Too. Thank you very much for entering the "Dragons Lair Designs" October "Anything Goes" challenge. Good luck.